ISLAMABAD, Oct 22 (APP): Finance Minister, Senator Muhammad Ishaq Dar Saturday said that due to government’s prudent policies, the country’s economy has made a turnaround from the verge of collapse to stability, however opponents were unable to digest this progress. 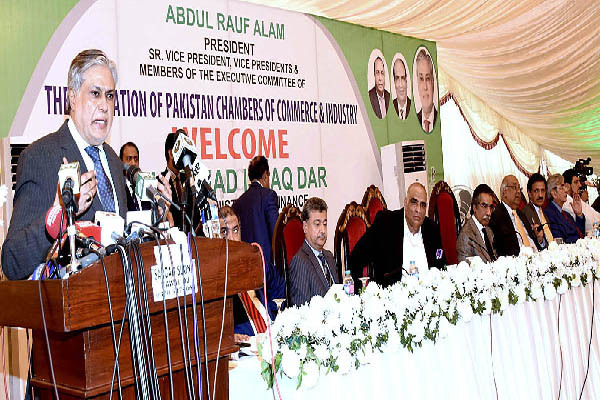 The opponents are aware that if the current government completes its tenure, it would be hard for them to win next election as the PML N government has not only taken the country out of crisis but has also developed economy on sustainable grounds, the Minister said while addressing the inaugural ceremony of new building of Federation of Pakistan Chambers of Commerce and Industry (FPCCI) here this afternoon. He said that the government aims at lifting the GDP growth rate from current 4.7 percent upto 7 percent in near future, adding that the economic indicators have shown considerable progress during the past three years of the government. International Monetary fund (IMF) have predicted 5% growth rate during the current fiscal year. He said the foreign exchange reserves have increased from less than $7 billion three years ago to over $24 billion now while the forex reserves of State Bank of Pakistan (SBP) have also increased from Just $3 billion to $19 billion. He said that the country’s economy has performed well and ranked from negative to positive and now stable adding that 22 reputed financial institutions of the world have acknowledged and appreciated the economic performance by Pakistan. The minister said that there has been 60 percent increase in the tax collection during the past three years which is a healthy sign for economy. He said that despite slow down in the world economy, a good response was witnessed in the sale of Sukuk bond in the international market which was taken at 5.5 percent rate, expressing the hope that the position would further improve when Pakistan approaches international bond market next time. He said that businessmen were equal partners in this journey of progress and prosperity and lauded the services of prominent businessman, Iftikhar Malik for promoting the interests of business community. Dar said that there was need that we focus on national interests instead of defending personal ones. He stressed the need for separating politics from economy saying that he has been advocating for developing sustainable economic policy in consensus with all the political parties to take the country forward. He said that the menace of loadshedding would be overcome by 2018 as additional electricity is being injected in the national grid. He lauded the efforts of the army and security agencies of the country for making the Zarb e Azb operation successful.